Now with a more comfortable shape design for pouncing. The Air Wrangler Small Torch Roller is precision CNC milled from aircraft grade T-6 aluminum, a solid 1" diameter aluminum hub supports the high-density foam roller which is attached with two stainless steel axle bolts. Foam roller measures approximately 1¾" in width. 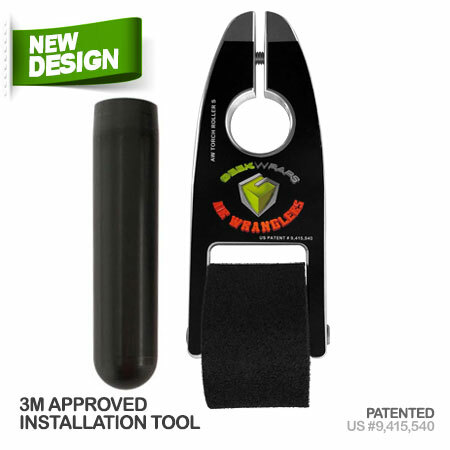 It features a solid, impact-resistant, Delrin handle for comfort and ease of use. The strength, flexibility and durability of the leverage handle helps relieve wrist strain. 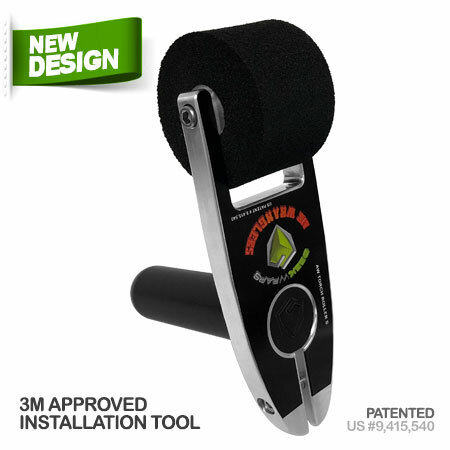 This revolutionary double duty forearm roller will lay down your wrap over rivets and textured surfaces in record time. You'll never look at rivets and wall wraps the same way again. 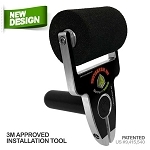 Think of it as a portable hand mounter, like used in many of your shops, it uses a rubber roller allowing you to apply adhesive backed vinyls to vertical substrates. Lightweight and easy to handle, the Air Wrangler Small Torch Roller works great for all those normal size rivets on box trucks and aluminum trailers. Not advised for calender vinyl. Whether your heat source is a heat gun, torch or both, the hybrid Air Wrangler roller is the best system out there.